"Despite decades of literature asserting that early hominins impacted ancient African faunas, there have been few attempts to actually test this scenario or to explore alternatives," Faith says. "We think our study is a major step towards understanding the depth of anthropogenic impacts on large mammal communities, and provides a convincing counter-argument to these long-held views about our early ancestors." To test for ancient hominin impacts, the researchers compiled a seven-million-year record of herbivore extinctions in eastern Africa, focusing on the very largest species, the so-called 'megaherbivores' (species over 2,000 lbs.) Though only five megaherbivores exist in Africa today, there was a much greater diversity in the past. For example, three-million-year-old 'Lucy' (Australopithecus afarensis) shared her woodland landscape with three giraffes, two rhinos, a hippo, and four elephant-like species at Hadar, Ethiopia. "Our analyses show that there is a steady, long-term decline of megaherbivore diversity beginning around 4.6 million years ago. This extinction process kicks in over a million years before the very earliest evidence for human ancestors making tools or butchering animal carcasses and well before the appearance of any hominin species realistically capable of hunting them, like Homo erectus," says Faith. Further analysis showed that the onset of the megaherbivore decline began roughly 4.6 million years ago, and that the rate of diversity decline did not change following the appearance of Homo erectus, a human ancestor often blamed for the extinctions. Rather, Faith's team argues that climate is more likely culprit. "The key factor in the Plio-Pleistocene megaherbivore decline seems to be the expansion of grasslands, which is likely related to a global drop in atmospheric CO2 over the last five million years," says John Rowan, a postdoctoral scientist from University of Massachusetts Amherst. "Low CO2 levels favor tropical grasses over trees, and as a consequence savannas became less woody and more open through time. We know that many of the extinct megaherbivores fed on woody vegetation, so they seem to disappear alongside their food source." "We know there are also major extinctions among African carnivores at this time and that some of them, like saber-tooth cats, may have specialized on very large prey, perhaps juvenile elephants" says Paul Koch. "It could be that some of these carnivores disappeared with their megaherbivore prey." "Looking at all of the potential drivers of the megaherbivore decline, our analyses suggest that changing climate and environment played the key role in Africa's past extinctions," said Faith. 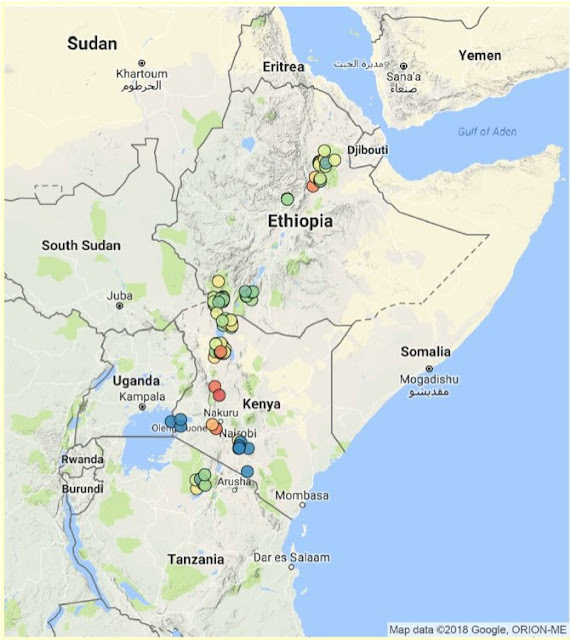 "It follows that in the search for ancient hominin impacts on ancient African ecosystems, we must focus our attention on the one species known to be capable of causing them - us, Homo sapiens, over the last 300,000 years." The study is published today in the journal Science.